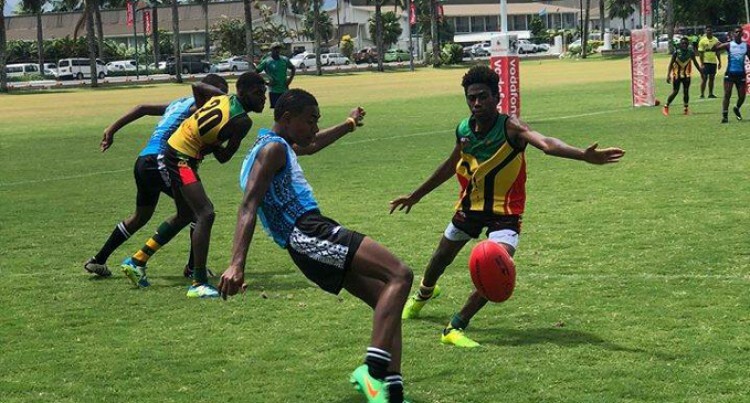 Fiji Junior Tribe has booked their spot in the final of the AFL Oceania U15 cup competition after defeating favourites Nauru Stars 6-5-41 at Albert Park yesterday. The two teams will meet each other again in the grand final today at 1:30pm while Va­nuatu Volcanoes play Pacific All Stars in the third and fourth place playoff at 10:30am. The Fijians were dominance over Nauru who only managed to score 3-5-25 in a fiercely fought contest. The Fijian boys came out of the blocks quickly kicking the first three goals of the match before the Nauru boys were able to steady and register two of their own to close the gap at half time. The game was terrific and the skills on show were first class. In the end the Fiji Jnr Tribe kicked away in the third quarter and the Na­uru stars couldn’t chase them down with Fiji registering the win. A terrific match played between the Nauru Stars and the Vanuatu Volcano’s. The Vanu­atu boys pressured the Nauru boys causing some errors but couldn’t capitalise on their opportunities early. A fast break saw the Va­nuatu team register a terrific goal through Charles Kennedy. The Nauru side started to hit up their short targets and with Samson Hubert kicking a huge torpedo goal with the aid of a good breeze saw the Nauru side fin­ish the game kicking 4 majors to seal the vic­tory. It was a fiercely fought contest between the Fiji Jnr Tribe and the Nauru Stars. The Fiji boys came out of the blocks quickly kicking the first 3 goals of the match before the Nau­ru boys were able to steady and register 2 of their own to close the gap at half time. The game was terrific and the skills on show were first class. In the end the Fiji Jnr Tribe kicked away in the 3rd quarter and the Nauru stars couldn’t chase them down with Fiji register­ing the win. The Vanuatu Volcano’s came out firing in game 6 kicking 8 goals up until half time. The Volcanoes were fast and used their space well to good effect. The pacific All Stars steadied after half time and missed some shots on goal but held Vanuatu goal less in the third. The game was tough and played in great spirits. Vanuatu came away with a much-deserved victory after a terrific game.